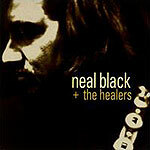 CD review: "Neal Black & the Healers"
Do we really need another blues-based guitar-slinging singer from Texas? Someone else to be held up to Johnny Winter and Stevie Ray Vaughan, with all the unreasonable expectations and subsequent disappointments that seems to entail? Hell, if they can play this good, why not? Neal Black plays a meaty, gristle-choked guitar and sings like the Marlboro Man at the end of a long day. He's somewhere between the Allman Brothers, Howlin' Wolf and Merle Haggard  but with a darker disposition than any of them. Black's guitar playing is so outstanding and his songwriting so catchy and fresh, you'll have a hard time getting this CD out of your stereo. His blues-based licks are always soaring off in some new direction, and he never lets a desire for speed overcome the need for taste and restraint. Now, as talented as he is, Black is unlikely to be getting airplay anytime soon. Lyrics like "I don't get the blues when I'm stoned" just aren't going to fly in these hypersensitive times. But if find yourself in need of a serious guitar fix, this album ought to do the trick.